Internal Battery Back-Up Actuators | Indelac Controls, Inc.
Internal battery backup actuators are a type of failsafe electric actuator used in rotary applications. 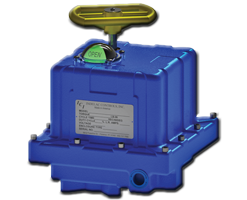 These actuators are relied upon in all industrial applications that require a valve or damper to move to a predetermined fail-safe position in the event of power failure, allowing for valve control in an emergency or other shut down situations. Actuators equipped with internal battery backup systems work by using an internal trickle charger to continuously charge a sealed lead acid battery during normal operation. When the system detects loss of utility power to the actuator, stored energy in the battery is used to drive the actuator to the preconfigured home or safe position. 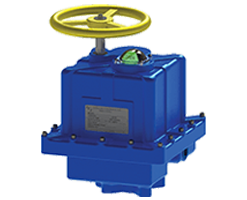 Upon restoration of power, the valve or damper is automatically returned to the normal operating position without further required action from the operator. These failsafe electric actuators equipped with backup batteries are available in a variety of voltages to meet different customer voltage requirements including 115vac, 230vac 1ph, 12vdc, 24vdc, and 24vac. Batteries are located inside the actuator housing, making these actuators more compact than comparable spring return actuators, and actuators utilizing external battery backup systems. This makes them an ideal solution for situations where installation space is limited. Fail Closed: Switches the valve or damper to the closed position when power loss is detected. Fail Open: Switches the valve or damper to the open position when power loss is detected. Run: Leaves the valve in an operating state when power loss is detected. Our line of actuator units come in a standard NEMA 4 enclosure for protection against external contaminants such as water, dust, and dirt. NEMA 4X housing options is available offering corrosions resistance during operation outdoors. NEMA 7 enclosures can be selected if the actuator units are to be subjected to hazardous locations and explosive environments. Additional corrosion-resistant coatings – such as anodizing, epoxy coating, electroless nickel plating, and chromium conversion coatings – can be applied to the housing unit for operations subject to high concentrations of corrosive agents. Contact the Indelac team for more information about coatings and availability or new coatings specific to your application. To find out more about our internal battery back-up actuator units, please contact us or request a quote. Our technical team is available to assist you in determining the best actuator solution for your application.